New York Times bestselling author Jennifer Chiaverini is back with another enthralling historical novel set during the Civil War era, this time inspired by the life of “a true Union woman as true as steel” who risked everything by caring for Union prisoners of war — and stealing Confederate secrets. 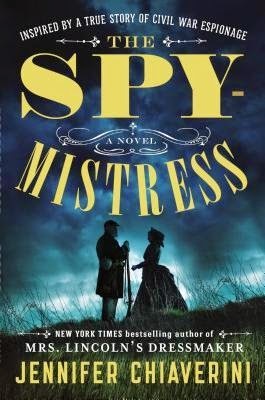 The Spymistress by Jennifer Chiaverini is based on the true story of Elizabeth Van Lew, a Virginian woman who became a Union spy during the American Civil War. Lizzie is widowed and living in Richmond at the outbreak of the Civil War. She is a staunch Unionist and is mortified to see her neighbors siding with the Confederates and calling for war. The price for having Union sentiments is a steep one, with torture and death the likely outcome, so it’s with great risk to herself and her family that she begins smuggling letters and information to Union officers who were locked up in Confederate prisons. She also built and operated an intelligence network with fellow Unionists to aid the Union prisoners’ escape, all while keeping up the appearance that her cause lies with the Confederates. Lizzie was later rewarded for her work by President Ulysses S. Grant by being appointed the Postmaster of Richmond, a highly coveted position. This is a hard book to review for me. On one hand I learned so much and it’s very evident that Chiaverini is meticulous about her research and I greatly admire that, but there were times where it read more like non-fiction and became too heavily detailed and slow. I also wish there had been more time spent on character development as I didn’t feel as connected to Lizzie as I would have liked. There is no question that Lizzie was an insanely courageous woman who deserves to be remembered and I am very glad to have spent some time with her. Despite the few nuances I had with this book, I am still looking forward to picking up a copy of her novel, Mrs. Lincoln’s Rival. I read the sneak peek of it in my ARC and it was very promising. Jennifer Chiaverini is the author of ten Elm Creek Quilts novels and An Elm Creek Quilts Sampler and An Elm Creek Quilts Album, as well as Elm Creek Quilts and Return to Elm Creek, two collections of quilt projects inspired by the series, and is the designer of the Elm Creek Quilts fabric lines from Red Rooster fabrics. She lives with her husband and two sons in Madison, Wisconsin. For more information on Jennifer and her novels, visit her website. You can also find her on Facebook and Twitter. Jennifer Chiaverini is currently on tour with TLC Book Tours, please see the schedule of stops here. To win a copy of The Spymistress please complete the form below. The giveaway is open to US residents only and ends on May 23rd. Bummer - I didn't have a sneak peak in my finished book. Now I love, love, love Civil War history so I guess it wasn't as dry for me. thanks for the giveaway, I need to read more histfic on this period! Thanks for giveaway.sounds like my type of book. Elizabeth Van Lew was a character in another HF novel I read recently. I'd like to read more about her. Thanks for the giveaway. I love novels set during the Civil War. It sounds like an amazing book. Thanks for having the giveaway. I have heard a little about Elizabeth Van Lew in the past, but not many details. The excessive detail which slowed the story for you, should satisfy my curiosity about this brave woman. Like you, getting to know the characters is important to me. I suspect she may have had so much information she wanted to get into the book, that she didn't leave room for character development. Thank you for the review and participating in the giveaway. I love historical fiction and this sounds like a "must read".